Do you have something planned for the bank holiday weekend? If not, we might have the perfect solution for you! The Oxford Wine Festival is making its debut this year. Learning about wine and food while being entertained by live music is the right recipe for an exciting weekend – perfect for food and wine lovers. Read our interview with the organisers of the festival to learn more about the event and get some fantastic insider advice on wine & food! Tell us about the Oxford Wine Festival – what is it all about? This is our first year of the Oxford Wine Festival but our aim is to become the leading wine festival in the UK. We expect about 2.500 wine and food lovers to come. The festival itself takes place in the Oxford Union, which is a historic and beautiful venue. It is actually one of the UK’s most prestigious debating chambers – which makes the venue very special to us. We offer a variety of things at the Wine Festival. There will be 35 UK leading wine merchants exhibiting at the event. We are covering 30 different wine regions. And, of course, we are going to have lots of music and food during the festival. For those with a very special interest in wine, we are also offering 16 different wine tastings ranging from a diversity of levels. So, a beginner can come along to learn the basics about wine while we also offer classes for advanced wine lovers to get in-depth information. That sounds great! With so many things going on – could you tell us what exactly makes the Oxford Wine Festival so special? Well, I think Oxford itself is a very special city. I find it very unique – full of beautiful buildings and open-minded people. It is a very multicultural city. That’s why we want to attract both locals and tourists to our festival. The second aspect that makes the event special is the impressive range of wines we have on offer. We really have wines from all regions and parts of the world such as India, Macedonia, Slovenia and the US. I really think that makes it very special.The third point is certainly the historic venue. As we specialise in Italian cooking holidays, are there any Italian wine highlights at the festival? Of course there are! We have Italian wine tastings. One of the highlights is an Italian Master Class with Michael Palij. He is a Master of Wine – one of only 300 worldwide. We also have three Italian exhibitors. Omina Romana, for example, is from the region of Lazio. They are one of the UK leading wine merchants selling wines from Italian emerging regions. 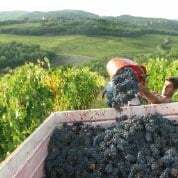 Kilgarriff and Kahan are from the Emilia region and have an impressive portfolio of some of the best frizzante and spumante wines. And then we have Bat and Bottle who specialise in classic Italian wine from traditional wine regions such as Tuscany, Puglia or Veneto. Seems like like there will be something for everyone’s taste! So, what is your favourite Italian wine? Oh, I think it has to be Amarone. It’s a rich Italian red wine made with sun dried grapes that has a higher percentage of alcohol than other wines. I really like the depth of colour and intensity. But, I have tried and loved so many Italian wines! So, what is it that distinguishes an Italian wine from others? That’s not that easy to answer. The world of wine has become much more complicated. Countries learn from each other. And there are so many Italian wines! But, generally speaking, they have a cherry aroma and some rusticity to them – something you can experience at a blind tasting. What I would also say is that Italian wine is designed to go with food. It is definitely part of the broader Italian food culture. Interesting. What would be your favourite food & wine pairing then? Well, I love food that is simple but done well. I particularly like cheese and meats and I would recommend having a Valpolicella Ripasso with that. Finally, could you tell us 3 characteristics of how to identify a good wine? Of course. The first and probably most important characteristic of a good wine is the taste that lingers in your mouth. If the taste at the end becomes unpleasant or even chemical you can be sure it’s not a good wine. The taste should improve the longer the wine stays in your mouth. So, the second aspect is the mouth feel. If the wine feels unpleasant or harsh, then it is probably not of high quality. And the third characteristic is the aroma. These three things are a winning combination! The Oxford Wine Festival takes place at the Oxford Union on 23 and 24 August. It features more than 35 exhibitors, live jazz and food stalls. Entry (£19.50) includes tutored tastings and six wine samples.